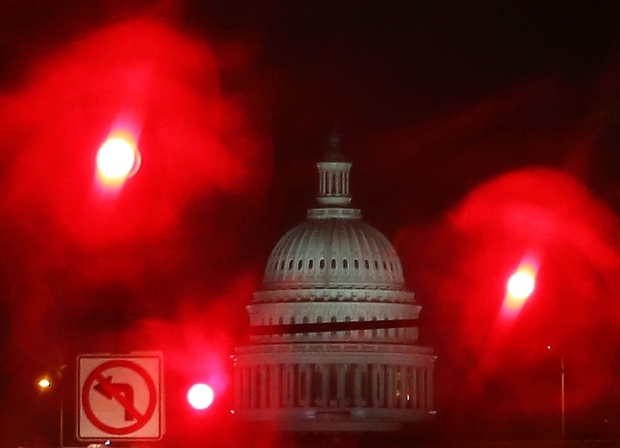 The U.S. Capitol on a rainy morning on October 9, 2013. Uncomfortable Bedfellows: How Much Does China Need America Now? The D.C. dysfunction puts China in a difficult place. Any financial markets turmoil that occurs because of a failure of Congress to do its job could harm China’s economy, and especially its exports. The accumulation of massive foreign-exchange reserves, now at record levels, is a feature not a bug of China’s economic model, and in spite of increased talk of diversification China has few viable options beyond U.S. government securities for those massive reserves. A default or debt crisis that hits U.S. Treasuries not only would reduce the value of China’s massive holdings of U.S. government securities but would also open the leadership to domestic criticism for having so much of China’s “hard-earned” money invested in the U.S. The heavily cited Xinhua piece calling for a “De-Americanized world” was written for the Xinhua English service and did not get huge play in domestic media. Between the huge holdings U.S. government assets and the large number of officials with financial and family ties to the U.S.A., excessive criticism of the D.C. dysfunction could be a double-edged sword. The debt standoff is temporarily over, apocalypse isn’t now and everyone can take a deep breath. For China, its big dance partner, the U.S., is still too big and important economically to be abandoned or ignored or snubbed. But the terms of the deal are changing. America’s fundamental economic power may have not been badly hurt—this time—but America’s fundamental soft power has been dealt a harsh blow. How much does China need America? Now—and for the foreseeable future—a lot. No other market, no other destination for reserves really compares. For China that’s a question with a fairly simple answer. The questions for the United States, though, are different. How much does America need influence with China? How much influence does it actually have? It may need influence. It may crave influence. Sometimes, still, it may even demand influence. But the credibility gap has widened. There are key issues where Washington’s voice could be useful and important: trade, economic reform, political reform, human rights, rule of law—the list is long. The spectacle on the Potomac, however, has weakened that voice far more than just an acute case of laryngitis. To regain some projection, the U.S. needs to go after the chronic problems, address some of its own fundamental issues, narrow the credibility gap and try hard to climb up to the moral high ground again. Nothing has changed. The United States still exercises effective hegemony over the world economic and political system. China may occasionally resent that reality, but the benefits of participating in that system far outweigh the drawbacks. The agenda-setting power of the U.S. is visible in two recent Chinese economic reform initiatives: its consideration of joining the U.S.-led Trans-Pacific Partnership (TPP), and its request at the last Strategic and Economic Dialogue to re-open negotiations on the bilateral investment treaty (BIT) with the U.S. Chinese leaders know that to generate the productivity gains needed for sustained economic growth they must lower trade and investment barriers, and secure better access for Chinese firms to investment deals abroad. To achieve those goals, they must deepen their engagement in a trade and investment regime whose rules are largely determined by the United States. Second, China’s U.S. Treasury holdings are long-term assets of the People’s Bank of China, which can hold the bonds to maturity and never needs to mark them to market. So the “losses” that might occur as the result of Washington’s periodic budget theatrics, or an end to the Federal Reserve’s quantitative easing program, are entirely imaginary. China still depends heavily on U.S. economic leadership, and runs little risk by playing America’s game. For the worst part of this idiocy, from the China-related standpoint, is that it provides fodder (already in wide use) for the reactionary ideologues now apparently riding high in the P.R.C. official media, who point urgently to the insidious menace of U.S.-inspired “hostile Western forces” dedicated to the P.R.C.’s undoing AND to the concomitant “proof” (exemplified by the past 16 days in Washington) that the American political and economic systems are ungovernable and thus dangerous to the world. Just as the Snowden mess seems to have silenced—for better or for worse—the public criticism of China for alleged massive cyber-penetration of U.S. corporate and government secrets, so now, thanks to a bunch of elected “legislators,” a tiny fraction of whom, if any, have ever been to China or perhaps have ever traveled outside of the United States, the U.S. is debased before the world. The forced absence of President Obama from the APEC and related meetings in Southeast Asia, as distilled in the “Leaders” photo with Secretary Kerry (thanks to his non-Leader rank) relegated to the farthest corner of the rearmost row of those in the picture, was just testimony to the same thing. Moreover, it hardly need be mentioned that the ideologues who are using American disarray to “prove” the fallacy of “blind worship” of U.S.-inspired ideology and practice are the same figures who have no use for intellectual pluralism and diversity of opinion and expression at home. I understand Arthur’s “nothing has changed in the fundamentals” comment, but I think there’s more to this situation than the economics he concentrates on. And simply telling our Asian friends, let alone the Chinese, that “nothing has changed in the fundamentals” is not going to get us very far. China needs America. Yes, of course, China has reacted—as much of the world has—to the tiresome drama of America’s current political dysfunction. It is an easy rhetorical hit. But in the wider picture, China needs America. However much China complains about U.S. hegemony, it is that hegemony that has allowed China to become an economic power without the costs of maintaining the peace and stability that global giants have traditionally had to secure to guarantee their resources and supply lines. The U.S. security umbrella has allowed China to build up an energy dependence in the Middle East, for instance, without an engagement in the politics. It encouraged China to buy an important copper concession in Afghanistan without, it seems, thinking that it might need to consider the security challenges of exploiting it. Now the scale of the challenges there and elsewhere are evident, but China is not politically ready to meet them. China is faced with the realities of its long supply lines and fixed assets— pipelines, for instance—in unstable and troubled regions. Is China ready to shoulder the burden of defending these? Not yet, it seems. However hostile the rhetoric, China knows that it has had a free ride on the U.S. order to date and it is a long way off taking on the complexities of replacing it. Let us suppose, for the sake of argument, that Beijing's Mandarins are sick of D.C.'s dysfunction and decide to park their money someplace else. Set aside the question of what you can safely do with some $3 trillion (Mattresses? European estates? Russian minerals? Buy Australia? Free lottery tickets for everyone in China?) and imagine a world where U.S. debt is just as good as anyone else's. What a relief. Americans could safely squabble all day long without fear of looking irresponsible. Maybe we wouldn't be such a super power anymore, but what's so super about it anyway? Let someone else handle the next international human rights debacle—maybe even China. Where's the shame in being a gently faded former super power?